JeGeekJePlay: Eiji Aonuma, producteur de The Legend of Zelda: Breath of the Wild, invité à Japan Expo pour une Master Class ! Eiji Aonuma, producteur de The Legend of Zelda: Breath of the Wild, invité à Japan Expo pour une Master Class ! Communiqué de presse - 1er juin 2017 - Le festival Japan Expo, pour sa 18ème édition, recevra M. Eiji Aonuma, Yusuke Nakano et Satoru Takizawa le vendredi 7 juillet 2017 pour une Master Class sur le thème « The Art of The Legend of Zelda Series ». Celle-ci aura lieu à 12H30 sur la Grande Scène. 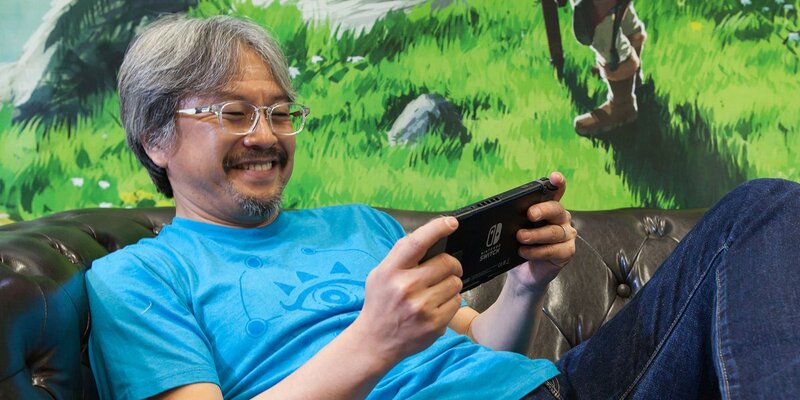 Eiji Aonuma est le producteur de "The Legend of Zelda: Breath of the Wild" et Directeur Général Adjoint. Il a rejoint Nintendo en 1988 et a travaillé, entre autres, sur "Marvelous: Another Treasure Island (Directeur)" et sur la série "The Legend of Zelda" dont "The Legend of Zelda: Ocarina of Time (Directeur)", "The Legend of Zelda: Majora's Mask (Directeur)", "The Legend of Zelda: The Wind Waker (Directeur)", "The Legend of Zelda: Twilight Princess (Directeur)", "The Legend of Zelda: Four Swords Adventures (Producteur)", "The Legend of Zelda: Phantom Hourglass (Producteur)", "The Legend of Zelda: Spirit Tracks (Producteur)", "The Legend of Zelda: Skyward Sword (Producteur)", "The Legend of Zelda: A Link Between Worlds (Producteur)" et "The Legend of Zelda: Tri Force Heroes (Producteur)". Yusuke Nakano est illustrateur de la "Bataille de Ganon" de "The Legend of Zelda: Breath of the Wild" et "Senior Specialist" de Nintendo. Il a rejoint Nintendo en 1992 et a travaillé sur la série "The Legend of Zelda" dont "The Legend of Zelda: Ocarina of Time (Illustration)", "The Legend of Zelda: Majora's Mask (Illustration)", "The Legend of Zelda: Oracle of Seasons/Oracle of Ages (Illustration/design des personnages), "The Legend of Zelda: The Wind Waker (Illustration)", "The Legend of Zelda: Twilight Princess (Illustration/Design du personnage principal)" , "The Legend of Zelda: A Link Between Worlds (Illustration)" et "The Legend of Zelda: Tri Force Heroes (Illustration)". Satoru Takizawa est Directeur Artistique de "The Legend of Zelda: Breath of the Wild" et "Senior Specialist" de Nintendo. Il a rejoint Nintendo en 1995 et a travaillé sur des titres comme "Super Mario 64 (Design des ennemis)" et sur la série "The Legend of Zelda" dont "The Legend of Zelda : Ocarina of Time (Design des ennemis)", "The Legend of Zelda: Majora's Mask (design des ennemis)", "The Legend of Zelda: The Wind Waker (Design Manager)", "The Legend of Zelda: Twilight Princess (Directeur Artistique)", "The Legend of Zelda: Skyward Sword (Design Support)" et"The Legend of Zelda: The Wind Waker HD (Directeur Artistique)". A cette occasion Nintendo France organise un concours de fan art sur le thème de "The Legend of Zelda: Breath of the Wild" dont les gagnants seront déterminés par M. Aonuma, Nakano et Takizawa et révélés durant la Master Class. Plus d'informations sur le concours seront révélées prochainement.